Walking the Labyrinth of My Heart: A Journey of Pregnancy, Grief and Infant Death breaks the lonely, silent suffering of bereaved mothers facing infant and pregnancy loss. Dianna Vagianos Armentrout details her pregnancy journey with her daughter, Mary Rose, who died an hour after birth of trisomy 18, a random genetic illness described as “incompatible with life.” For five long months of pregnancy, she knew that her baby would not live and thrive, planning a funeral and seeking hospice for her unborn daughter. The heaviness of this grief, which most women bear alone, is shared here and will comfort mothers who have experienced miscarriage, stillbirth and infant death. Through journal entries, essays and poetry, Dianna invites the reader to process grief and honor the life of the child, no matter how brief. In addition, readers will learn how to support the bereaved by remembering the baby and pregnancy. With eloquent language, fierce honesty and a record of the rawness of grief, readers in the midst of their own suffering will recognize the path that bereaved parents walk. Dianna’s experiences with infertility, motherhood, infant loss and miscarriage infuse her writing with compassion for all women. Finally there is a book to honor the pregnancy, baby and loss, loving the children past their death, loving the wombs that nurtured them and accepting the sacred path of mothering children whose bodies are broken, but whose souls are intact and perfectly whole. This book shines with love and the knowledge that even the briefest life is holy. Read it. Share it. Spread the word. We no longer have to grieve our infants and pregnancies alone. This is a very emotionally intense story to read. 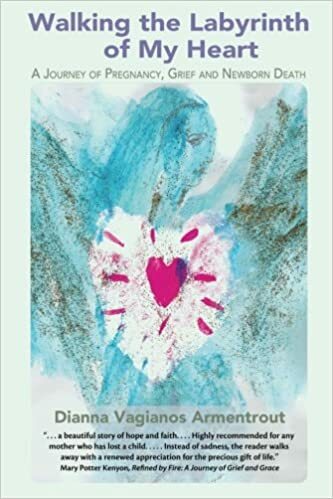 If you have gone through the pain of losing a child, this book will comfort you as you will join Dianna while she recalls her painful journey of miscarriages and infant loss. I have personally seen friends losing their children as soon as they were born and some also suffered multiple miscarriages. This book would teach them all how to honour their kids even after their death and how to gracefully overcome the loss while still remembering them for the rest of your lives. I must say the author is indeed a very strong woman and this book deserves a 5-star for sharing her story with the rest of the world. I’m so glad you enjoyed ‘Walking the Labyrinth of My Heart’!